The jack heads are designed for ease of disassembly when repacking. An oil collection groove is provided and arrangement is included to connect an oil drain line to catch and reclaim oil that collects in the groove (it is necessary for the piston to carry a film of oil through the packing in order to provide smooth and quiet operation). 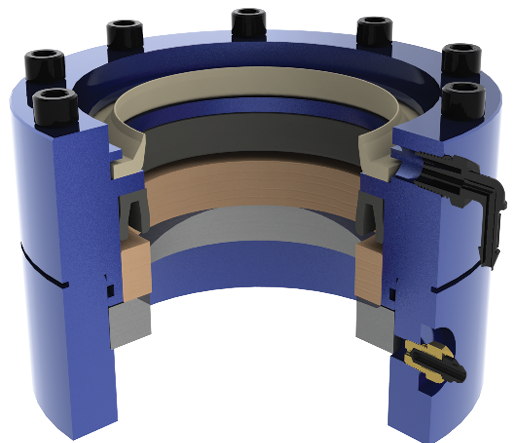 The packing gland arrangement consists of a "pressure balanced" "U" type seal, a bearing and a wiper ring. Seals are designed for 150°F (65°C) maximum operating temperature. We recommend a brand of ISO VG 32 turbine oil with a viscosity of 150 ssu @ 100° F (38° C). A biodegradable (vegetable)oil is acceptable if it meets the same specifications. The upper end of the piston is fitted with a drilled and tapped plate, to receive a standard bolt for attachment to the platen plate (special mounting arrangements can be provided). The bottom of the piston is closed with a steel plate and is fitted with a stop ring to prevent the piston from leaving the cylinder. The piston is ground and polished to a surface finish of 15 to 20 µin (.38 to .50 μm). Allowable variation in diameter after polishing is ± .015" (.381 mm). Multi-section pistons are joined with an internally threaded coupling, using Acme type thread for ease of assembly with O-rings for a proper seal. All sections are assembled, sanded, and polished across the joints to ensure a matching surface. Jack units manufactured for in-ground, or partial in-ground installations are furnished with a safety bulkhead and seamless steel pipe cap at the bottom of the cylinder. Holeless units include a flat steel mounting plate, all in accordance with ASME A17.1/CSA B44. Bleeder plugs are included to purge air from the jack unit. Standard pit supports are welded to the cylinder for mounting to pit channels when required (various designs can be provided to suit any requirement). A threaded or grooved oil line connection is provided. All cylinders are thoroughly cleaned, inspected, and tested for oil leaks. Then they are painted with a heavy coat of an anti-corrosive material. All in-ground jack units are equipped with inspection ports on the base plate.